I feel like shopping for moms is a hard thing to do. We don’t really need anything and even when we do, we typically prefer to spend our money on our kiddos — selflessness at its finest! But hey, we deserve a little something at the holidays too, no matter how many times we say, “I don’t need anything for Christmas.” So if you’re having a tough time shopping for a mama in your life, here’s a little guide for mom’s to get some good ideas on your life! I had this sign made for our master bedroom and it’s one of my favorite pieces in our home. It’s a part of the wedding vows we said on our wedding day so it holds such a special meaning in our lives. They’ve got gorgeous quotes in their shop too if there’s nothing custom you want to hang in your home. But in my eyes, this is a gift every mama would cherish! These are my FAVORITE. We have a subscription where we get these printed directly from Instagram every single month (I’m totally a sucker for printed photos) but you could create a special one-time book for a grandma or grandpa, a pregnant mama or any mom in your life with beautiful memories! Any they’re super inexpensive but meaningful so that’s totally a win in my eyes! One of my favorite gifts I’ve ever received from my husband is our nativity scene. It’s something I grew up having in our home during the holidays and something I’ve always wanted to have in my own with my own kids. So pulling it out at Christmas time puts the biggest smile on my face and reminds me what this special time of year is all about! Okay so I must be living under a rock because I just discovered TOMS boots and according to all of you, my life is going to change when I own my first pair. “Comfiest shoes ever” is a common message I got after posting about these on my stories and they’re all just so stylish and cute! Comfy and cute? Yes, pelase! I’m not huge into baking or cooking but baking with Ava makes my heart so happy. 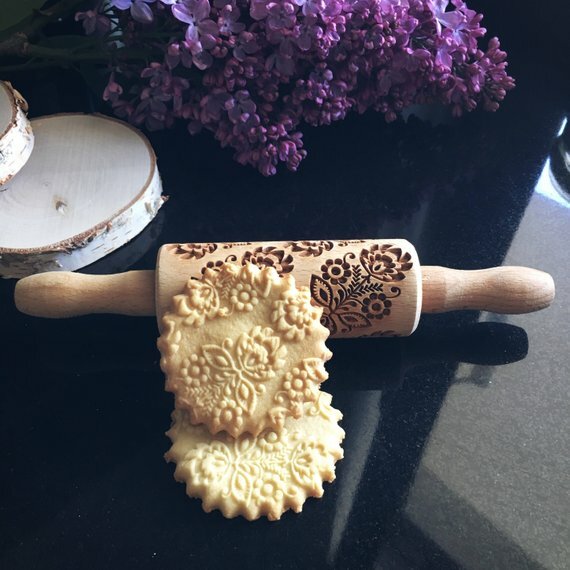 I’d make cookies and pies and treats every single day with her if I could and this darling cookie roller is something that popped up on my Facebook feed a couple weeks back and I thought it was just the cutest little gift idea! or if you love one you see below, just click on the image and it’ll link to that exact roller and the shop that sells it! I posted about these bags a couple weeks back and they have changed my life. Seriously. They fold up flat but they fit so much stuff inside. I literally did an entire grocery trip and fit it all in two bags. No joke. These things are life! A mom can never be pampered enough so getting her a massage, a mani-pedi, a facial or a spa day will always be a good idea. What is it about moms and wine? I’ve got to admit — I’m a total whiskey girl over wine (but not right now, for obvious reasons) so snagging her a bottle as a gift is something you definitely can’t go wrong with! Apparently this is the current new trendy thing to own? I honestly havent even looked into it at all but it’s all the rave right now, so I’ve been told. I never knew what I was missing out on until my husband bought me my first “big girl pillow” years back. Like, a nice pillow that’s the perfect comfort and makes me sleep like a baby (outside of pregnancy, that is). Good idea? I think so! 23 and Me was a gift my dad gave to all of us one year for Christmas and it was so fun to find out so much about our background and my husband’s too! If only I had a maid to clean my home every single day…wouldn’t that be nice? We do all the cleaning around here but I feel like this would be the perfect gift idea for a mom? A deep clean of your home to make it feel nice and fresh without doing any work. And apparently Amazon offers this now? Who knew! We haven’t tried it out yet but I love Amazon so I’m sure I’d love this too! Anything that self cleans a home is a win in my eyes. Enough said. This little thing has seriously made my life so much easier. You know how many times I’ve lost my keys or my phone and I’ve torn apart the house looking for them? With Tile you can click the button on your phone or click it on your keys and the device you’re missing will ring nice and loud for ya. You can put it in your wallet (they’ve got thin ones for that), on your purse, wherever you want it! Lifesaver. I just love this stuff. One of my sisters got me an Alex and Ani bracelet for Christmas one year with meaningful charms on it and it’s my absolute favorite. You can get initials, dates, birth stones, sports teams…you name it! It’s custom and it’s personalized and it’s a special gift any mom would love.